Myanmar court rules police testimony supporting journos credible - SABC News - Breaking news, special reports, world, business, sport coverage of all South African current events. Africa's news leader. The prosecution asked the court to label the policeman a hostile witness in the case, but the court refused this request. A Myanmar court ruled Wednesday that crucial testimony from a whistleblowing policeman in the case against two Reuters journalists is credible, a decision seen as a “ray of light” by the defence. Reporters Wa Lone, 32 and Kyaw Soe Oo, 28, have been in custody since December. They are accused of violating the country’s Official Secrets Act for possessing material linked to security operations in conflict-hit Rakhine state. The charge carries up to 14 years in prison. Over months of pre-trial hearings, their defence team has insisted they were set up — lured to dinner by a police source who handed them documents for which they were subsequently arrested. 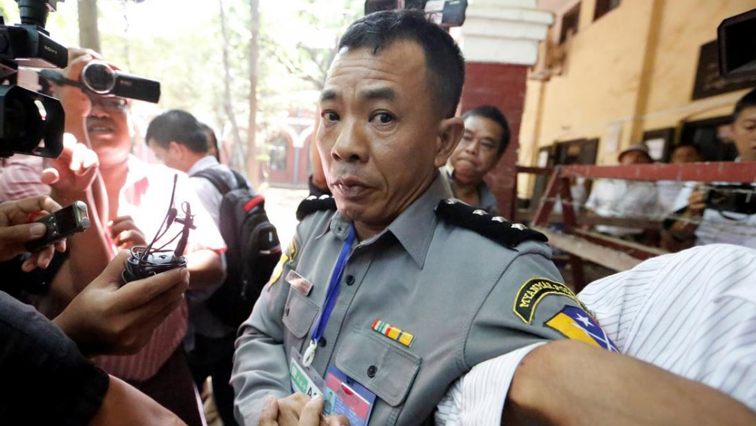 Court testimony last month by Deputy Police Major Moe Yan Naing backed up that version of events, even though he had been called as a prosecution witness. He said a superior ordered his men to set up the sting which resulted in sensitive documents being passed to the reporters. In response prosecutors asked the court to declare Moe Yan Naing a hostile witness. But the court found no problems with the police officer’s account. “The court rejects the proposal claiming the law officer to be a hostile witness,” Judge Ye Lwin told the hearing Wednesday. A lawyer for the journalists welcomed the decision. “I am elated. The court has proved itself as a court of justice,” Khin Maung Zaw said. “We have seen a ray of light. It strengthens our case.” The two journalists were also buoyed by the court ruling. “We are happy about today’s decision. This shows that the truth will come out and proves that we have been treated unfairly,” Wa Lone told reporters before they were taken back to prison. On April 30 the police officer was jailed for breaching a police disciplinary act, a charge he had faced since December for previous communications with Wa Lone. Police sources said he was sentenced before he gave his shock testimony to court — an extremely rare instance of a security official openly challenging superiors in the formerly junta-run country. In addition, the family of Moe Yan Naing was evicted from their police housing a day after he gave evidence. Police denied the two events were connected. At the time of their arrest, the reporters were investigating the extrajudicial killing of 10 Rohingya men in the village of Inn Din in the north of Rakhine state. The military has denied allegations of widespread atrocities against the Muslim minority. But it did concede that security officers took part in the killings at Inn Din which were later reported by Reuters. Some 700,000 Rohingya have fled to neighbouring Bangladesh since the army-led campaign was launched last August, ostensibly to combat Rohingya insurgents. The stateless group has faced decades of systematic discrimination and persecution in mainly Buddhist Myanmar. This entry was posted on 02 May 2018,12:50PM at 12:50 PM and is filed under World, News, Homepage Latest Stories Slider. You can follow any responses to this entry through the RSS 2.0 feed. Both comments and pings are currently closed.